Wonderful holidays and a Happy New Year from Savvy Business' team! Savvy Business sLTD, under the Framework Service Contract MOVE/ENER/SRD/498-2016 Lot 1, will be assisting Milieu Ltd in the implementation of the specific contract “Conformity assessment of the transposition of Directives 2014/45/EU (on periodic roadworthiness tests for motor vehicles and their trailers), 2014/46/EU (on the registration documents for vehicles) and 2014/47/EU (on the technical roadside inspection of the roadworthiness of commercial vehicles circulating in the Union)”. Savvy will carry out in-depth legal analysis of the conformity of national transposition and implementing measures with specific provisions of the Directives for Greece, Cyprus and Bulgaria. On 29 November 2018, Savvy Business sLTD’s team attended the forum “The Future of the Labor Market: New Opportunities", organized by the Ministry of labor and social protection of the Population of Kazakhstan with the aim to discuss employment and social development prospects in Kazakhstan in the context of dynamic changes in the global labor market in connection with 4th Industrial Revolution. Among the Government representatives, Prime Minister of the Republic of Kazakhstan Bakytzhan Sagintayev, Minister of Labour Madina Abylkassymova, Vice Minister Nariman Mukushev took part in the work of the forum along with the representatives of international organizations and IFI’s, as well as large transnational and local companies. For the successful implementation of the contract No KZSJ-2.2/CS-02-QCBS “Provision of consulting services on compiling inventory, assessment and prequalification selection of training service providers” in the framework of the World Bank “Skills & Jobs” project, Mr. Michalis Karamanis received Award of Excellence for active contribution to project implementation. During the last two years, we have noticed a considerable progress of the implementation of RES projects in Kazakhstan which now became a priority of the government’s energy policy, especially after November 2016, when Kazakhstan ratified the Paris Agreement. Today, the share of RES in the total energy market of Kazakhstan is 1% but the target is to reach 3% by 2020 through the implementation of projects (total capacity 2000 MW- including 960 MW of wind farms, 750 MW of solar power and 290 MW of hydroelectric power) for which contracts for the purchase of electricity from RES have been already concluded with the investors. Since 2009 until today, the total amount of investments in the RES sector amounts to about 58.5 billion tenge (approx. 140 M euro) based on the data of the Ministry of Energy of Kazakhstan. According to the Minister of Energy of Kazakhstan, Mr. Kanat Bozumbaev, currently, there are 65 operating RES facilities in the country, including 12 wind farms, 19 solar, 33 hydroelectric power stations and 1 biogas plant. During the first half of 2018, they generated 629.5 million kW/h of electricity. All RES projects in Kazakhstan are financed by investors in exchange for a guaranteed purchase of electricity from RES for 15 years at fixed tariffs or auction prices, exemption from payment for transporting RES electricity or investment preferences in accordance with the Business Code. The bottleneck was the mechanism for the determination of fixed tariffs and marginal auction prices. Another main concern for investors was the issue of "long" money in the national currency, since the facilities are operating on the domestic market, and they will not receive foreign exchange earnings. Now the government changed the current formula for indexation of auction prices, taking into account changes in the tenge's exchange rate to convertible currencies by 70%, and to the consumer price index by 30% from the second year of production. Such a scheme eliminates the currency risks of investors. This will allow investors to attract cheaper loan financing in foreign currency and the bidding will lead to a decrease in marginal auction prices. The Development Bank of Kazakhstan, which is a local bank, provides loans for the construction of solar, wind power stations and small hydro power plants. As of today, European Bank for Reconstruction and Development (EBRD) is the sole international project finance provider for renewable projects in the Kazakhstan. Based on a memorandum signed with the government, EBRD provides loans up to 200 million euros for the implementation of renewable energy projects with the possibility of attracting private investments of other international financial institutions for a total of up to 480 million euros. Last week, according to EBRD’s source, on 18 October 2018, the EBRD signed a loan and the project support agreements for a new solar plant with up to 28 MW capacity in Kyzylorda region, southern Kazakhstan. The solar park project will be constructed and operated by Nomad Solar LLP, a special purpose company incorporated in Kazakhstan and owned by the French company Total Eren SA and the United Arab Emirates company Access Infra Central Asia Ltd.
On 8th October 2018, our manager Ana Maria Tutea, attended the conference entitled "Digital Metamorphosis: Achieving growth in business and banking” organized in Athens by the Economist Events for Greece, Cyprus, Malta & SE Europe. Retailing, telecommunications and tourism were the sectors discussed in regards with the digital revolution. The event managed to present a variety of views and opinions regarding the digital world and the changes that the society would suffer due to the digitalization. Starting from July 2018, we will cooperate with Milieu Ltd - Law & Policy Consulting, Brussels, Belgium as subcontractor within the Framework contract No MOVE/ENER/SRD/2016-498 “Legal economic and technical assistance in the fields of energy and mobility and transport” for Lot 1-Legal assistance in the field of energy and Lot 4- Legal assistance in the field of mobility and transport. The duration of the framework contract is 4 years. We will mainly cover legal conformity checking for countries such as Romania, Bulgaria, Cyprus and Greece. In April 2018, our firm in consortium with GOPA Infra GmbH, TRT Trasporti E Territorio srl and IRU Projects ASBL has been shortlisted in for the EU Technical Assistance tender: Europeaid/139029/DH/SER/MD “Support to reform of the transport sector in the republic of Moldova” budget EUR 1,000,000. On December 14, 2016, Giorgi Turdzeladze, head of the Georgian branch of KLC Consulting was a guest of the Radio Show "Liberty Morning" in Tbilisi, Georgia. In April 2018, our firm in consortium with GOPA Infra GmbH, TRT Trasporti E Territorio srl and IRU Projects ASBL has been shortlisted in the EU Technical Assistance tender: Europeaid/139029/DH/SER/MD “Support to reform of the transport sector in the republic of Moldova” budget EUR 1,000,000. On December 14, 2016, Giorgi Turdzeladze, head of the Georgian branch of KLC Consulting was a guest of the Radio Show "Liberty Morning" in Tbilisi, Georgia. The company cooperates with private companies as well as state agencies on the issues regarding improvement of the legislative framework and effective implementation of changes. Special attention is paid to the approximation and harmonization of the domestic legislation with the European Acquis. Mr. Turdzeladze talked about the legislative amendments that Georgia needs to proceed with, the necessary mechanisms for proper implementation of the legislative changes as per the obligations of Georgia according to the provisions of the Association Agreement between the European Union and Georgia, signed on June 2014, in force since July 1, 2016. In Astana, Republic of Kazakhstan, on 27-28 December 2017, KLC Consulting has successfully delivered a 2-days seminar on safety management system in accordance with the requirements of the International Code for the Management of Safe Operation of Ships and Pollution Prevention. KLC Consulting wishes all consultants, associates, partners and clients a joyful winter holidays and a New Year full of success and prosperity! This year, KLC Consulting has decided to move to another central location of Sofia and has donated its office desks, computers, chairs and office facilities to the Municipality of Petrich for the kids and people in need. This is our modest contribution to bringing joy and smiles to the families in need and to the feeling that Santa Claus is everywhere! Today, on the 14th of December, the director of KLC Consulting's Branch in Tbilisi was the guest at Radio Liberty's morning broadcast, where the perspectives and implementation of EU-Georgia Association agreement, along with legal approximation and implementation of European and International agreements have been discussed. In the context of JESSICA (Joint European support for sustainable investment in city areas') initiative in Greece, KLC Consulting in partnership with Mazars Greece has been selected by European Investment Bank to act as one of the Independent Experts to provide an opinion to Urban Development Funds (UDF) on the reasonableness and appropriateness of the terms of investments proposed by UDF managers in compliance with the relevant State aid notification. JESSICA Holding Fund Greece supports investments through financial intermediaries (the UDFs) in urban regeneration projects to facilitate sustainable and integrated urban development in defined areas The list of the selected Independent Experts of EIB is valid until 30.6.2015 and can be extended until 30.12.2015. KLC Consulting in consortium with WYG International and GOPA Consultants have successfully completed the project “Technical Assistance to the Ministry of Transport and Infrastructure of Albania”, funded by the European Union. 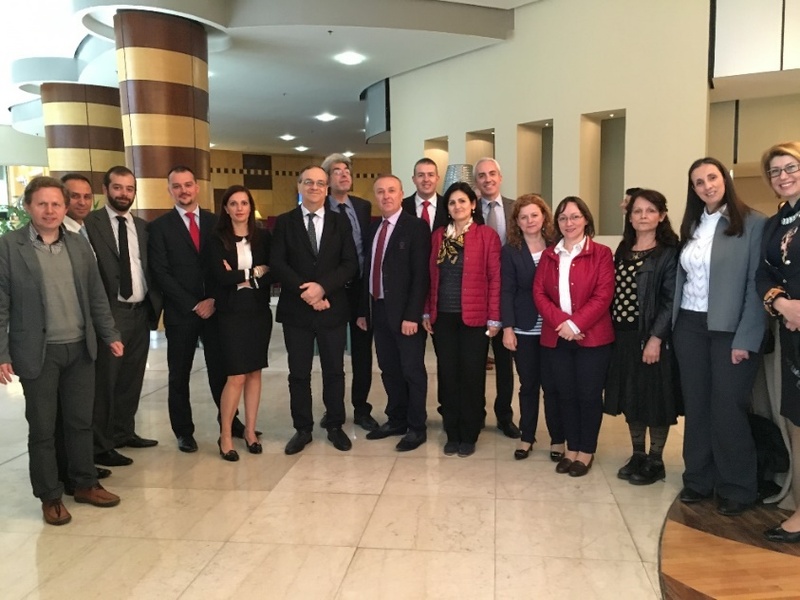 The closing conference of the technical assistance held in Tirana on 26th April, 2016, hosted the representatives of the Ministry of Transport and Infrastructure, the Delegation of the EU to Albania, who expressed their satisfaction for the completed activities on the legal approximation focusing on issue of dangerous goods’ transport, road safety, maritime safety, security and environmental protection, and the set-up of the railway sector frameworks in line with the priorities set up in the Stabilization and Association Agreement between European Union and Albania. The Project team has successfully provided capacity building to the implementing agencies on topics of maritime, rail and road. JESSICA (Joint European Support for Sustainable Investment in City Areas) is an initiative of the European Commission, supported by the European Investment Bank (the EIB) and the Council of Europe Development Bank. The initiative is designed to help Member States in using financial engineering mechanisms to support investments in sustainable urban development in the context of EU Cohesion Policy for the programming period 2007-2013. The initiative uses ERDF and national funds to invest in projects on a repayable basis by way of debt and equity. It therefore represents a more financially sustainable mechanism for investing public resources to achieve economic development objectives. KLC Consulting sLTD as Service Provider has been integrated in a list of independent experts following a Call for tenders (2012/S 213-351106 ) by the EIB as Holding Fund manager. It provides its services based on a concrete offer submitted to the specific UDFs. The result of the investments assessment is the State Aid Certification Report.